It was Grenadaâs fourth title in a row, since the regional component of the race began in 2011, then called the Round D Town Road Relay. One year after, it was changed to a NACAC/OECS event. The two-way straight fight with the host team, made up of Pamenos Ballantyne, Meshach Dublin, Junior Ashton and Caswell Lewis, created excitement, as St Vincent and the Grenadines took an early lead, which was maintained up to the final handover with Lewis. However, the crowd which wooed the home team was deflated as Joseph pipped Lewis, leaving St Vincent and the Grenadines to earn a beaver-trick of second places. Grenadaâs winning time was 26 minutes 44. 82 seconds. This was a faster run than the 27 minutes, 15.08 seconds registered in last yearâs event over the same distance. The Vincentiansâ time was 27 minutes 20.37 seconds, marginally bettering the 27 minutes 55.12 seconds clocked in 2013. For their efforts, Grenada pocketed US$1,000 and St Vincent and the Grenadines US$700. But while Grenada was taking the race for the fourth time, it was glory for the St Martinâs Secondary in the male category of the local segment, as Newman Peters, Truloni Mc Kemzie, Mocasa Bowman and Tyreke Anthony did it for their school. The four returned a combined time of 30 minutes 10.33 seconds. Taking the second spot was Central Leeward Secondary in 31 minutes 38.84 seconds and third â the St Martinâs second team. The third place time was 32 minutes 46.20 seconds. 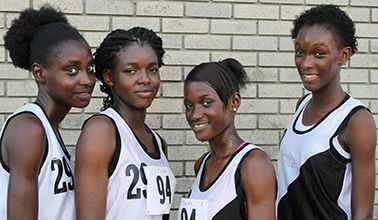 Among the females, the Thomas Saunders Secondary triumphed in 37 minutes 42.01 seconds. Second was the Girlsâ High School in 41 minutes 14. 14.68 seconds and third was Central Leeward in a time of 42 minutes 08.60 seconds. The winners in the secondary schools component each gained $400, while the second places got $300 and the third places, $ 200.